Yesterday, I completed a new update of my "Modern Cards" skin for JRiver Media Center. It contains some bugfixes and tweaks, and also introduces several new styles to choose from. Windows 8 (same as the original Duo version, but with Windows 8 window buttons). I'll probably add a couple more in a future update, but these will have to do for now. As always, you can download the skin from my DeviantArt page. None of my skins supports Retina/HiDPI display settings. You can find an explanation for why that is in this post I did a while back. 2014.08.28: Public release of the updated skin. 2014.08.28: Added a more pronounced search box for the Windows 8 version of the skin. 2014.08.27: Added 3 new editions of the skin: Windows 8, Ubuntu & OSX Yosemite. Thanks to "Awesome Donkey" for his help with testing and acquiring window buttons! Also tweaked the coloring of the original "Duo" version of the skin, and various bug-fixes. 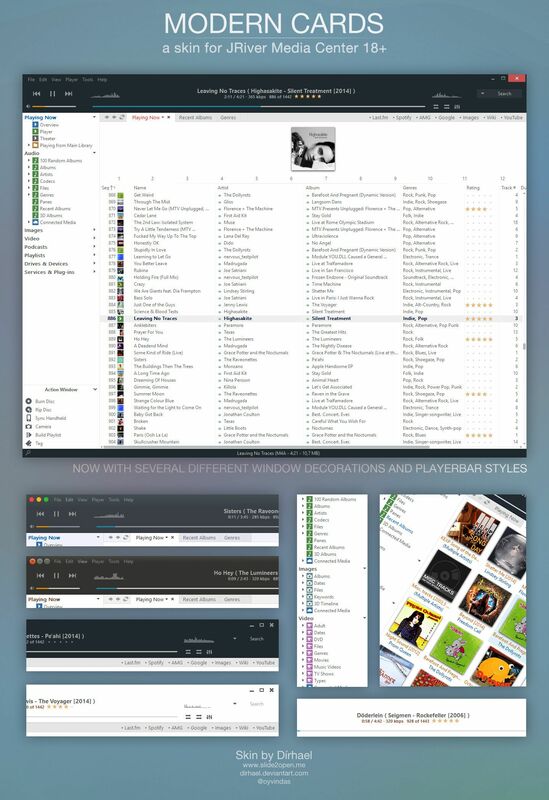 2014.08.24: Started implementing different window decorations, and playerbar styles. 2014.05.07: Started work on customized action window icons. 2014.05.07: Flatter look for my custom sidebar icons, a bit more in line with Windows 8 Modern UI (no new icons added yet). 2014.05.05: Fixed the broken DSP-direct button. 2014.05.01: Added a new duo-toned version of the skin, with a dark player- and bottom bar. Also tweaked the scrollbar handles in the original bright version. 2013.09.14: Fixed a couple of glaring bugs (such as a missing "repeat off" button, and a missing "dsp off" button).